1 of 4 Cut a thin slice from the top and bottom of the lemon, exposing the flesh. Stand lemon upright, and, using a sharp knife, cut off the thick peel, following the contour of the fruit and removing all the white pith and membrane. 2 of 4 Holding lemon over a medium-size bowl, remove lemon sections from membrane. Discard seeds and let sections fall into the bowl. Squeeze remaining membrane to extract juice into bowl. Break sections into pieces using two forks. Whisk 1 tablespoon water, the sugar, the mustard, 1/8 teaspoon of the salt and 1/8 teaspoon of the pepper into the lemon. Slowly whisk in 2 tablespoons of the oil. Stir in chives; set aside. 3 of 4 Heat gas grill to medium-high or prepare charcoal grill with medium-hot coals. Brush pork with 2 teaspoons of the remaining olive oil. Sprinkle with 1/4 teaspoon of the remaining salt and remaining 1/4 teaspoon pepper. Grill pork about 4 minutes on each side or until internal temperature registers 155 degree F on an instant-read thermometer. 4 of 4 Meanwhile, brush asparagus with remaining 1 teaspoon oil. Place on grill and grill 6 minutes, turning often, or until crisp-tender. Sprinkle with remaining 1/4 teaspoon salt. 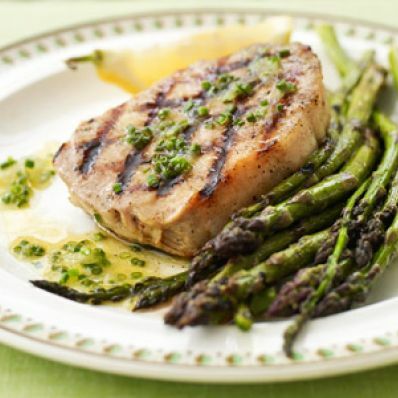 Serve pork and asparagus topped with lemon dressing. Per Serving: 16 g carb., 41 g pro., 107 mg chol., 17 g Fat, total, 4 g sat. fat, 6 g fiber, 467 mg sodium, 387 kcal cal.